The last thing you need when working outside in the elements is difficulty starting your equipment, or an unexpected breakdown on the jobsite. The UNDERHOOD™ air compressor is very reliable, and proven to operate in extreme cold conditions. Manufactured in North America in an ISO 9001:2015 certified facility, VMAC air compressors and multipower systems meet high quality standards, and are backed by an industry-leading Lifetime Warranty (Limited). Maintenance costs are greatly reduced by investing in the UNDERHOOD™ air compressor as high-quality aluminum parts, and few moving pieces means VMAC air compressors require less maintenance and servicing than a reciprocating air compressor. An UNDERHOOD™ air compressor also requires less maintenance than a hydraulic deck-mounted or engine driven air compressor because there is no hydraulic or engine-related components to maintain. To ensure the best performance, regular compressor maintenance is recommended by VMAC. Above-deck air compressors can cause a major safety hazard in snowy and icy conditions. Operators have to climb into the back of a snow and ice-filled truck bed to dig out the air compressor to allow it to warm up enough to function. In addition, parking a tow-behind on the side of the road to conduct maintenance is challenging and dangerous, especially in bad weather. By having the UNDERHOOD™ air compressor stored safely under the hood, boots are kept on the ground, ensuring the safety of operators, and limiting OSHA and WCB concerns and claims. The UNDERHOOD™ air compressor is mounted directly on your truck’s engine, which warms up the compressor on the way to the jobsite, and keeps it warm and protected from the elements, even when temperatures drop well below freezing. Working outside in harsh winter conditions can be challenging enough, especially when temperatures drop below freezing. The UNDERHOOD™ air compressor relieves common pain points that many operators suffer from each winter, from decreased productivity to unsafe working conditions. 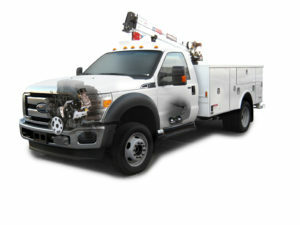 Waiting for an air compressor to warm up, climbing in the back of a slippery truck to dig out equipment, and conducting maintenance on the side of the road in dangerous driving conditions are just some of the challenges that you can take out of the equation with an UNDERHOOD™ air compressor. So when planning your investments for this winter, include an upgrade to an UNDERHOOD™ rotary screw air compressor, contact [email protected]. Learn more about VMAC’s line of UNDERHOOD™ air compressors, ranging from 40 CFM up to 150 CFM outputs.